A circuit breaker is a device designed to shut off an electrical circuit when too much current is flowing. This usually occurs if too many devices are plugged in or if there is a short circuit. 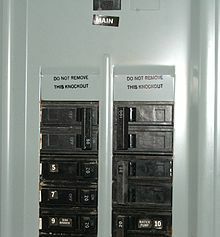 Circuit breakers are usually installed in the electrical panel. Some circuit breakers also have GFCI protection. Inside the circuit breaker, there is usually an electromagnetic coil. When too much current flows through the coil, it pulls on the switch, shutting the power off. The coil reacts to immediate short circuits. There is also a bimetal strip that will bend and pull on the switch if it gets too hot. This reacts to extended periods of too much current. Some advanced circuit breakers monitor current electronically, and shut the power off when an electronic sensor detects too much current. A circuit breaker does the same job as a fuse, but unlike a fuse, a circuit breaker does not need to be replaced to be reset, except in some severe cases such as very high-current short circuits and lightning strikes that may damage the circuit breaker. This page was last changed on 29 December 2017, at 06:23.